If having one Asian guy on a comedy show is unusual, then having two is just overkill. 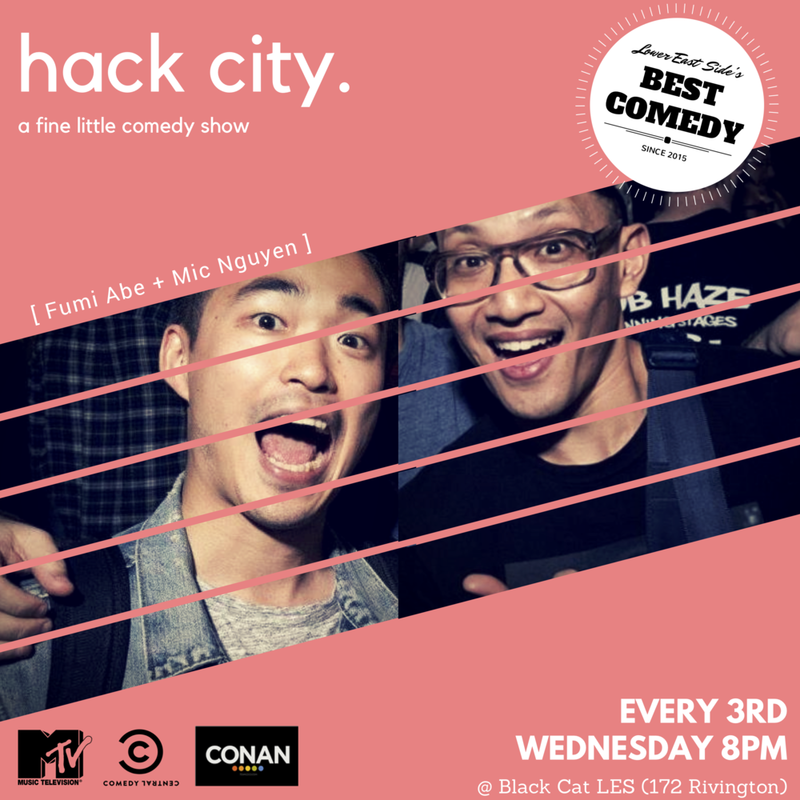 But that’s what comics Fumi Abe and Michael Nguyen are trying to do with their Hack City comedy show — overkill on the funnies. Join the two as they host one of NYC’s most diverse comedy show, featuring comics from MTV, Comedy Central, and your Twitter feed. Every 3rd Wednesday at Black Cat LES, 172 Rivington at Clinton St.
TimeOut NY calls it one of the best comedy shows in NYC! Free admission and crepes! Doors at 730 p.m., show at 8:00 p.m. Easy access off the Delancy-Essex Street F & JMZ. The last Friday of every month Phil Stamato, Daniel Raderstrong, and Fumi Abe gather together comics you might recognize from Comedy Central, MTV, Conan, and more with the express purpose of amusing you with a series of things that are probably "Nothing Important." Come out to the best comedy show in Crown Heights on a Wednesday night. Nothing Important was a part of the Brooklyn Comedy Festival in 2018! Show is ALWAYS followed by a dance party!